We have a lot of birds of prey around Broome and the most common are the Black Kites and Whistling Kites, which you see on a daily basis around the town itself. Smaller birds of prey include the Nankeen Kestrel, which will roost on the light towers at the town’s sport ovals and Brown Goshawks are often observed among the houses on the edge of town and we have even had a Spotted Harrier drop by to cool off in our garden! Larger birds around town include the Eastern Osprey, which is easily viewed in the port area and at Gantheaume Point year round and they nest at both of these sites. White-bellied Sea-Eagles can be observed cruising the coastline year round with their magnificent wing span and Brahminy Kites are often observed too. The largest bird of prey is the Wedge-tailed Eagle and is more often observed a few kilometres from town, though we have seen it in town over the years we have lived here. Beyond town you can expect to see Black-breasted Buzzards drop in at ephemeral lakes and also Swamp Harriers around any reed beds. Adding Peregrine Falcons and Australian Hobby to your year list around the Kimberley is not too hard and as you can see the birds of prey are well represented around Broome. Any road-kill soon gets cleaned up and small rodents and lizards need to keep their eyes to the sky! 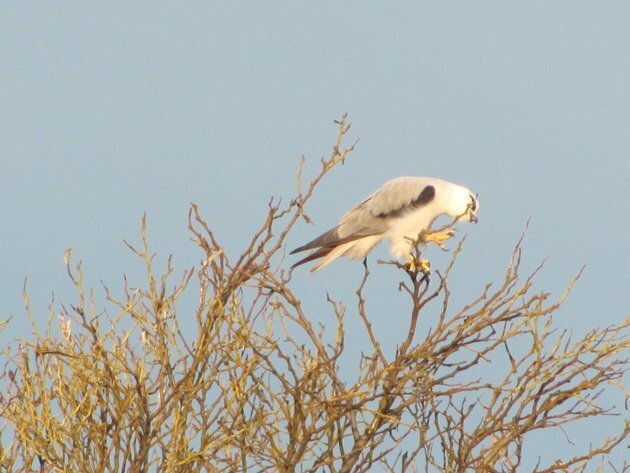 Black-shouldered Kites do not tend to be around Broome all year and are highly nomadic. However, when they do return it does tend to be to the same location each year. Often one can be observed on the outskirts of Broome after the Wet Season, which I may as well just call Summer months after our poor rainfall the past two seasons! The other good location is one of the few trees on the highway heading south of Broome towards Port Hedland. 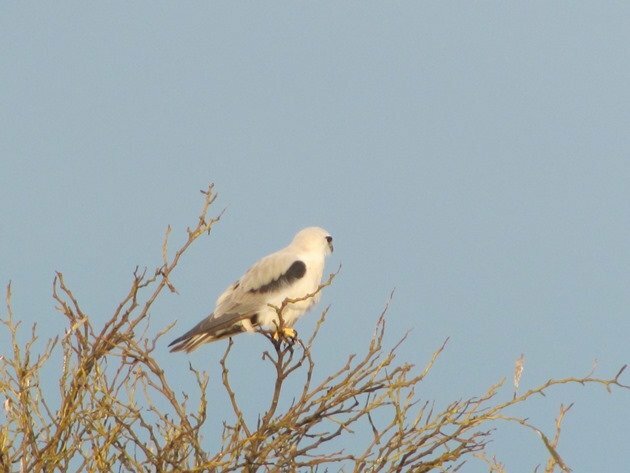 There are so few trees on that stretch of highway you will be unlucky to miss the presence of the Black-shouldered Kites when they are here, but for good measure the coordinates are 17 57 06. 94 south and 122 31 51. 31 east! They are there every year and they were there in that tree after our wettest June on record in 2013 and I photographed them in that exact tree! They returned in 2014 and 2015 and now there is one back in that tree! They both may have come back, because as we drove across the highway we observed one hovering over the grassy plains as you can see in the above photograph and the other bird may have been further afield. 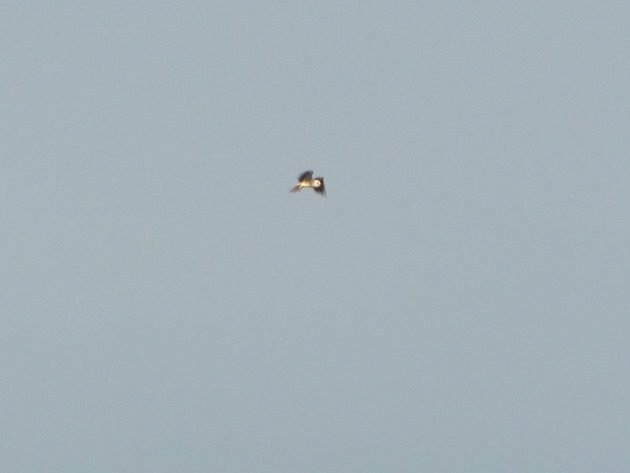 The wing beat is very fast and they are not dissimilar to a Nankeen Kestrel in the way they hover. 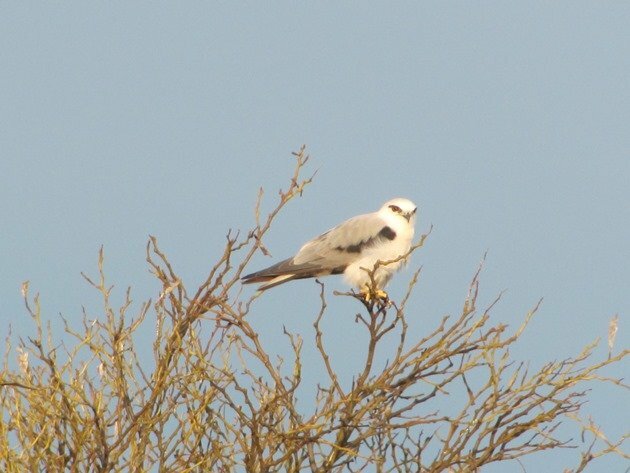 The Black-shouldered Kite then flew down to land in the tree beside the edge of the road and we pulled up beside it to take a photograph late in the afternoon. It has a very distinct red eye as you can see! 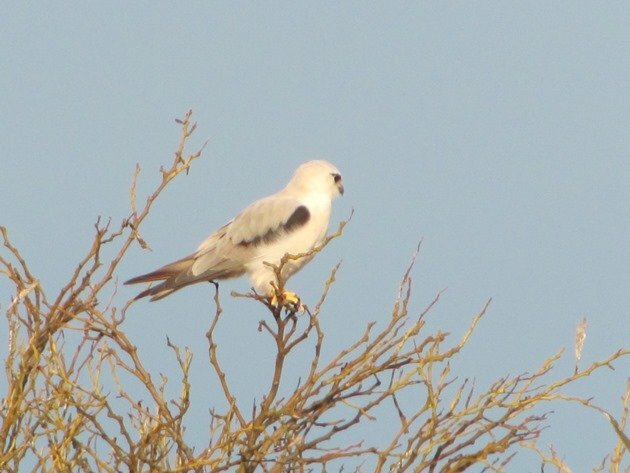 There is one other species that is similar to the Black-shouldered Kite and that is the Letter-winged Kite. The Letter-winged Kite is also nomadic, but feeds at night rather than in the day and has a slower wingbeat. It has eluded us over the years, but no doubt one day we will be lucky enough to encounter one in our travels! Meanwhile, if you happen to be in Broome then enjoy all of the birds of prey that are in the vicinity of the town! What a gorgeous kite! I love the red eye. 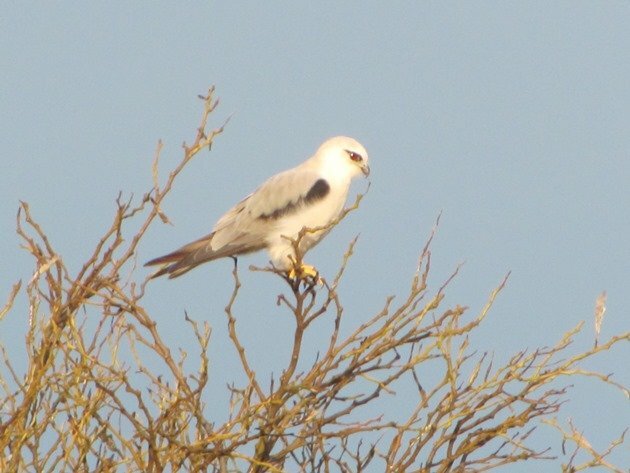 I saw a lot of these around Melbourne last week, was going to ask if you had ever encountered a Letter-winged Kite! What is the State Bird of Georgia?